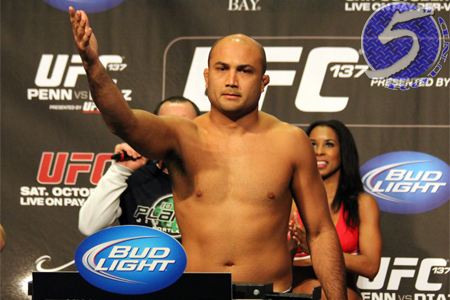 When it was announced former UFC welterweight and lightweight champion BJ Penn (pictured) would come out of retirement (again) and drop to featherweight to fight Frankie Edgar after the two finished serving as opposing coaches on “The Ultimate Fighter 19,” many questioned how Penn could possibly shed the pounds required to tip 145 on the scale. Well, according to UFC president Dana White, Penn has put down the Spam musubis and picked up his cardio regimen. White claims fans will be shocked at how thin the Hawaiian will look when the reality show airs. “I do, and BJ doesn’t see it that way,” White responded over the weekend when asked if this run marks Penn’s final hurrah. “BJ sees this thing as – well, first of all, everybody’s questioning his weight, he’s almost [at 145 pounds] now. Wait until you see how skinny BJ is. It’s crazy. BJ’s one of those guys that once he sets his mind to something, this is what he’s decided to do, and he believes he’s gonna rip through these guys and win that title. We’ve all seen and heard this song and dance before from Penn. ‘When BJ Penn’s motivated, blah, blah, blah.’ Regardless, he still always seems to gas in the later rounds or his newfound dedication doesn’t stick around for too long. However, it appears this may be the most committed “The Prodigy” has been towards his craft in quite some time give the drastic makeover his waistline has undergone. Remember the less than flattering pics of Penn that surfaced from the UFC’s pool party during UFC 148 weekend? Edgar holds a 2-0 edge over Penn, with both unanimous decision wins coming in lightweight title fights. TUF 19 is expected to debut in January. No date has been set for their trilogy.